The tops shown in this post were sent for a review. As always all thoughts an opinions are 100% my own. This spring has already gotten super hot here in Georgia. We make plans to go to different local food truck stops, the playground, local parks and more. Being a mom I look for comfort and non clingy tops. But I still like to be “hip”. I want fashions that have pretty details but feel like pjs. Is that too much to ask? PinkBlush has some gorgeous fashions that are comfortable and cute. The best part about there fashions are they are great for any woman. You don’t have to be a mom to wear their fashions, but if you are they are do have so many options. It doesn’t matter whether you are pregnant, nursing or done having kids. I love the many options and how their clothes are. Most of all the stretch in majority of their fashions work with a growing belly or just flow masking your mommy tummy (if you are like me). I chose to go with 2 pieces that had cute and tasteful peek-a-boo cutouts. 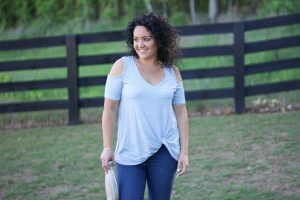 It gives these shirts versatility to be used during the day while chasing my toddler or out for a date night with my husband or girls night with friends. Head to PinkBlush and find your staple pieces for this spring and summer. Love how the pink one is long, my perfect kind of shirt ? ? 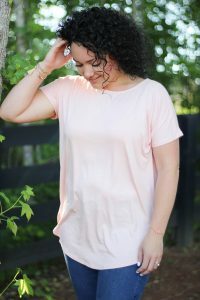 Love Pink Blush tops! I got a few for spring that have been on repeat! I love Pink Blush! They have the cutest finds! You look so cute in those colors! 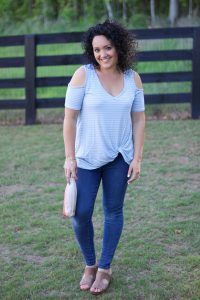 I love cute and flowy tops, so these are just my style! I need that pink top in my life! I love those tops. You look great.